For a long time, Chevrolet Camaro has been rated one of the best sedans in the market. 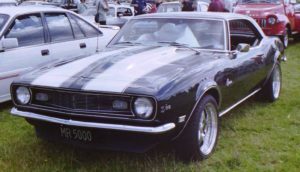 The first generation of the Chevrolet Camaro appeared in the market in September 1966 for the 1967 model. The 1968 Chevrolet Camaro has a rear wheel drive and has a GM F-body platform complete with two doors, couple or convertible. The 1968 Chevrolet give you the option to choose between a six cylinder and V8 power plants. The 1968 Chevrolet Camaro has a drivetrain which is either a 230 cu in straight-6, (3.8L) engine which is rated at 140 HP (104 KW) or a 327 cu in (5.4 L) V8 engine which is backed by a Saginaw three-speed manual transmission. The 1968 Chevrolet Camaro are available in different engine capacities. Some of the transmission options available for the 1968 Chevrolet Camaro include a four-speed manual option, a two-speed power glide automatic transmission option and a three-speed Turbo-hydro-matic 350 automatic option. There is also a larger turbo 400 three-speed automatic option.The styling of the 1968 Chevrolet Camaro is exclusive. It has an Astro ventilation, a fresh-air inlet system with side vent windows deleted. The car has side marker lights in the front and the rear fenders. The car also has a more pointed front grille and divided rear taillights. With its oval lights, the car has an appealing design. Some models of this Chevrolet has a chrome hood inserts that is similar to velocity stacks. To resolve the hop issues, the car’s shock absorbers are mounted to resolve wheel hop issues and higher performance off road. Some models of the 1968 Chevrolet model has multi-leaf rear springs instead of single-leaf units this gives the car comfort. The wheels of this car are V45s made from wheel works sized 17 by 9.5 inches and are wrapped in 285/40r17 Kumho Ecsta XS rubber. The car is also fitted with four front control arms, stabilizer bars, front coil springs and Bilstein dampers valves. The 1968 Chevrolet Camaro is a car to own.